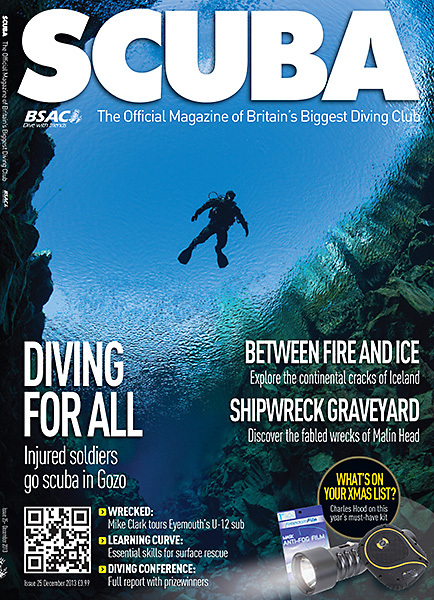 The December issue of SCUBA gets my shot of a silhouetted diver at the Silfra lagoon in Iceland. It's always pleasing to get a front cover. This shot was taken at a freshwater lagoon called Silfra in Iceland. It's a classic dive that has really put Iceland on the list of must do destinations. Silfra is a ground fissure in the Thingvellir National Park and is filled with clear filtered glacial melt water. It's cold water (2-4 degrees C) and has some of clearest water in the world. Thank you to Icelander, Einar Hansen, who is the silhouetted diver who hovered above me in the crystal clear water whilst I took this shot. Inside SCUBA there are several more of my images from Iceland. Nikon D600, Sigma 15mm, Fisheye dome port.